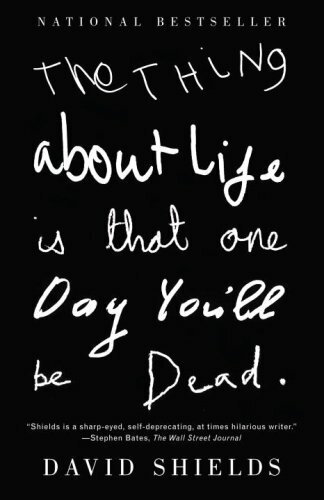 David Shields’ book, The Thing about Life is that One Day You Will Be Dead, bridges a harmony between intense academic structure and surprising narrative. Biological life cycle, literature, and historical fact act as massive levies shaping the story of a father and son. Sheild’s personal narrative is composed of ungulating prose, refreshingly feminine in their tenderness. He has the ability to expose deep personal vulnerabilities. Vulnerabilities which are mostly associated with being a man. Shield’s ego is satisfyingly missing. Sheilds’ moves the reader through a meditation on the biological life cycle. He shares a rich irony in Leonardo da Vinci deathbed sentiments: I offended God and mankind because my work did not reach the quality it should have. We are given passage into Sheilds’ relationship with his father. He brings us down into his personal mental loops, rounding the curves of his processing of the life cycle and his reoccurring connection to his father. The feel of the book is that of an author who is just as eager to find answers as we are. What will be my father’s last words? The thing about reading Sheilds’ work is it is an experience to crave, deliberately. I am a human rights advocate with a knack for inter-contextually. I am a storyteller, a ceramists, a pan-art lover, a feminist, and a humanist. This entry was posted in Book Recommendations, Creative Nonfiction, Criticism, Film, Literature, Memoir and tagged biology, book review, creative nonfiction, David Sheilds, family, father, Human Condition, life and death, literature, memoir, narrative non fiction, quotes. Bookmark the permalink. This is one of my favorite of Shields’ work. Have you read any of his other books? He has a new one out that I haven’t tried yet. This is the only work I’ve read by Shield’s so far. I’m interested to read more, from what I’ve read it looks like he deals with these same theme of the life cycle in most of his works. Have you found that to be the case? Human rights advocate with a knack for inter-contextually, a storyteller, a ceramists, a pan-arts lover, a feminist and a human-ist too.